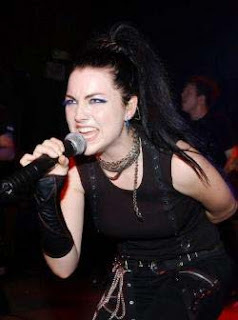 Amy Lynn Hatzler or Amy Lee was born in Riverside, California, December 13, 1981, Lee was born to John Lee, a disc jockey and TV Personality, and Sara Cargill. He has one brother, Robby, and two sisters, Carrie and Lori. Lee had a third sister. who died in 1987 at the age of three years from an unknown disease. The song "Hello" from Fallen album is rumored to be written to his sister, and the song "Like You" from album The Open Door with the lyrics, "I long to be like you, sis, Lie cold in the ground like you did," also shows the death his brother and a sense of grief for his brother. Lee studied classical piano for nine years. His family moved to several places, including Florida and Illinois, but finally settled in Little Rock, Arkansas, where Evanescence started. She graduated from Pulaski Academy in 2000 and also had a short follow with Middle Tennessee State University. He formed a band with Ben Moody. The two met at the Youth Camp when Lee plays "I'd Do Anything for Love (but I Will not Do That)" by Meat Loaf on the piano. During the year, they both play acoustic at Arkansas book stores and coffee shops before they recorded two EPs, Evanescence EP (in 1998) and Sound Asleep EP, also known as the Whisper EP (in 1999). In 2000, Evanescence recorded the longer EP, Origin. This demo contained three songs from the album Fallen and was written by Lee and Moody: "Whisper", "Imaginary" and "My Immortal". In 2003 Evanescence making their first major album, Fallen. This album has a 6x Platinum award, and was for 43 weeks on the Billboard Top 10. And more than 12 million copies sold of this album. The first major singles Evanescence: "Bring Me to Life" is a breakthrough for the band's world and reach the order of-5 on the Billboard Hot 100 in the United States, while "My Immortal" which are equally popular to achieve order-7 in the U.S. . Then the inclusion of these songs in the soundtrack of the movie Daredevil helped them become popular and make their position in the music world is established. "Evanescence also awarded a Grammy Award for Best New Artist. Two singles from the album Fallen released including" Going Under "and" Everybody's Fool ", which also made video clips. Dated October 22, 2003, guitarist Ben Moody left the band citing "creative differences". At the time of interview a few months later, Amy said: "We reached a point where if something is not defiled change, we will not be able to make a second album". Ex-Cold guitarist Terry Balsamo replaced Moody in the band, as well as a friend to write (songs) Amy. Anywhere But Home was released in 2004 on the format DVD / CD. This DVD is a recording of their show in Paris along with some backstage features, such signing CDs and warming up. His own CD contains several songs that had not been released as "Missing", "Breathe No More" (from the movie Elektra) and "Farther Away". Then the CD cover, there is also the Korn song "thoughtless" who ever they play in some live performances. Lee did the opening theme from the movie The Chronicles of Narnia: The Lion, the Witch and the Wardrobe and write some songs for the film, but the song was rejected for being too "dark and epic nature". However, Lee has said the rejection of his song was "an interesting material for our new album". When filling the show Live @ Much on MuchMusic session on January 9, 2007, Amy revealed that she had become engaged the night before. He then confirmed the EvThreads.com that he had proposed to by Josh Hartzler (29 years), his old friend who worked as a therapist. Lee stated in interviews that the song "Good Enough" and "Bring Me to Life" was inspired by Josh Hartzler. They were married on May 6, 2007, and honeymooned near the Bahamas. Lee has posted that she was Mrs. Amy Hartzler is now at EvThreads.com forum. Lee is famous for its neo-gothic feel, due to frequent use of gothic make-up and taste for Victorian-style clothing. He nevertheless designing her own clothes, including those she wore in the music video for "Going Under", and the clothes he was wearing at the Grammy Awards 2004. After she designed it she chose Japanese designer H. Naoto to make it. In concert, he often wears a corset and fishnets, as well as long skirts and high boots. He had a piercing (piercing) in his left eyebrow that looked at the cover album Fallen.